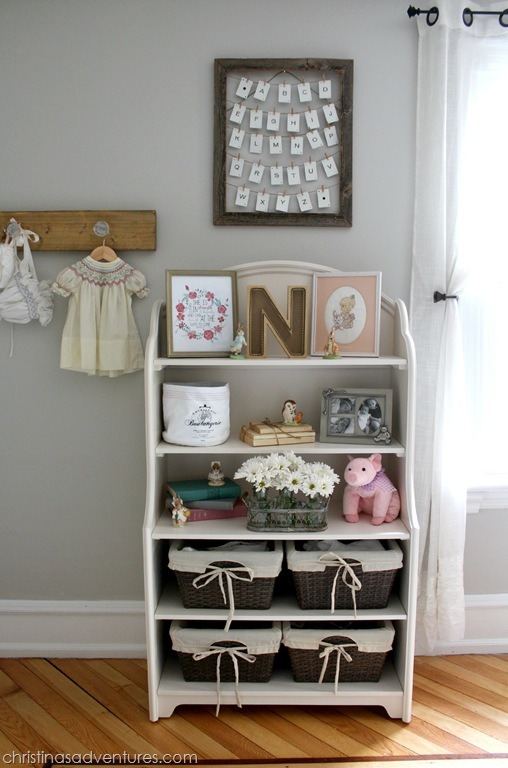 This vintage rustic nursery has gray walls, ivory and wood accents, and little pops of pale pink. 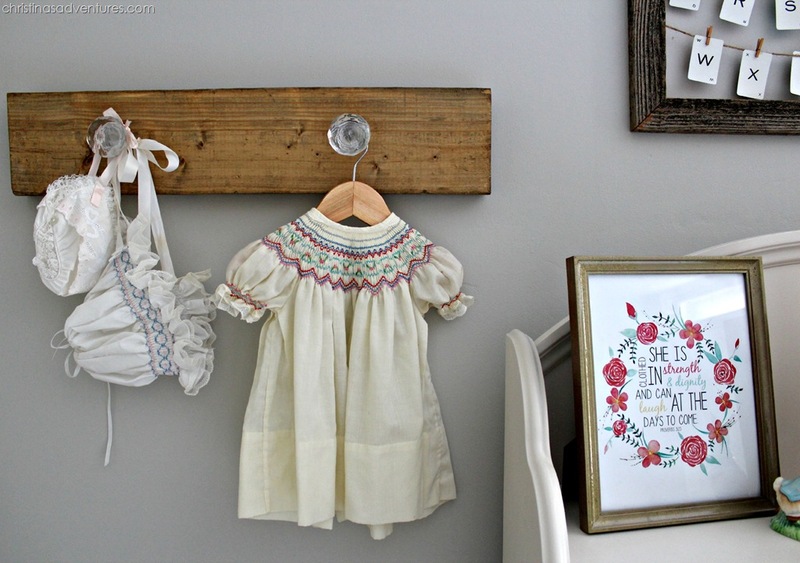 Adding vintage touches help to make this room a sweet place for a new baby. Affiliate links included – full disclosure here. 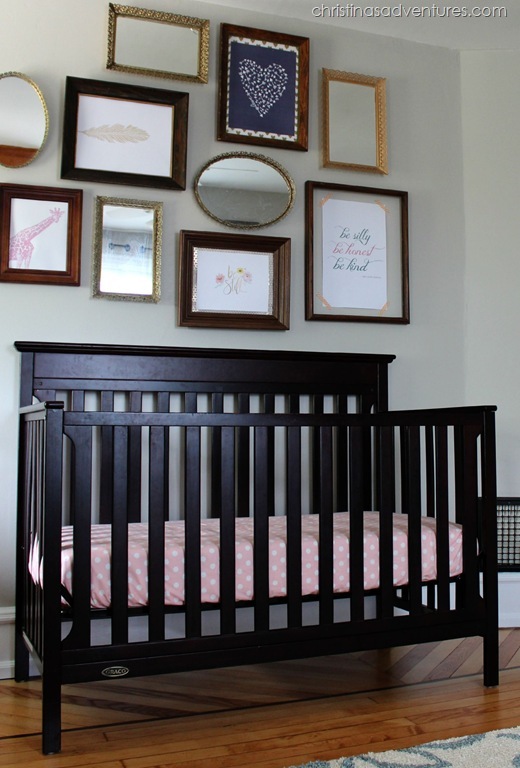 We are finally finished with our sweet little girl’s nursery! She just turned three months old (how did that go so quickly?! ), but we were working on finishing up our major kitchen renovation right up until her due date. We actually finished two days before I delivered her! So now we’ve been settling into life as a family of four, in our “new” (old) house, and we’ve finally made time to finish her nursery. Let me first tell you – I was shocked when we had a girl. My husband’s family is all boys (siblings & cousins), and after we had our first son, I mentally prepared to have all boys (and I was thrilled with that, by the way!). When we delivered a girl, I was more than a little surprised! We designed our boy’s nursery in our last house to be neutral, but since we designed this nursery after our girl was born, I could add in some girly elements. 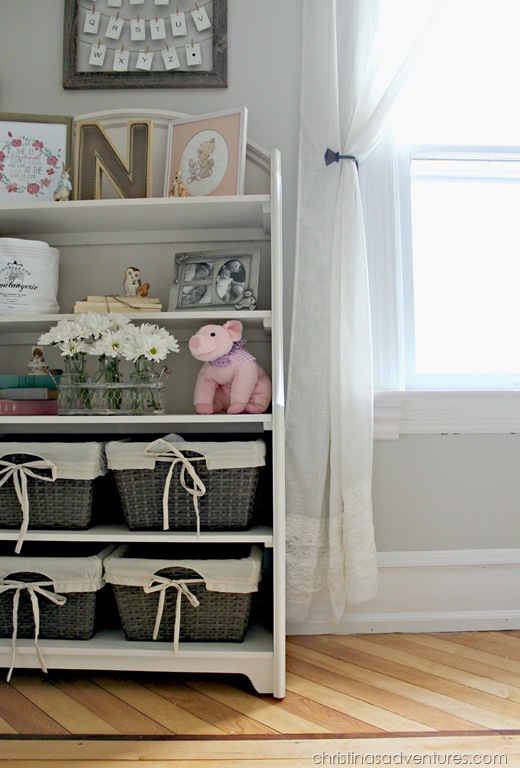 The problem: I’m really not into frilly & pink décor! 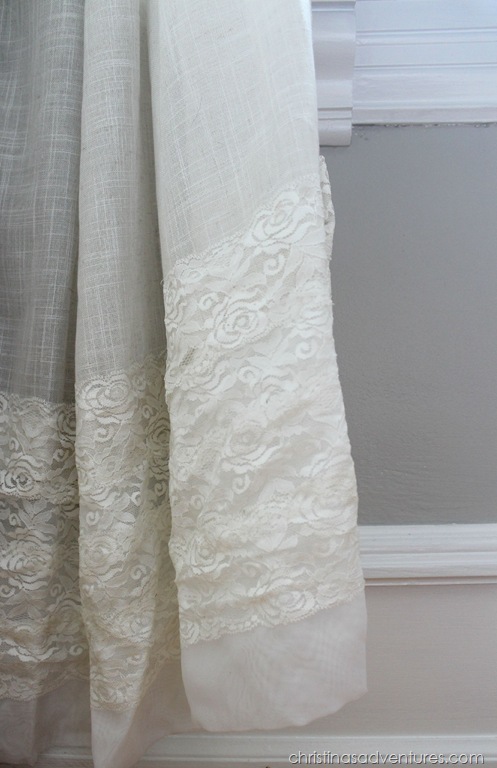 We opted to go for a vintage feel with some rustic and metallic elements. 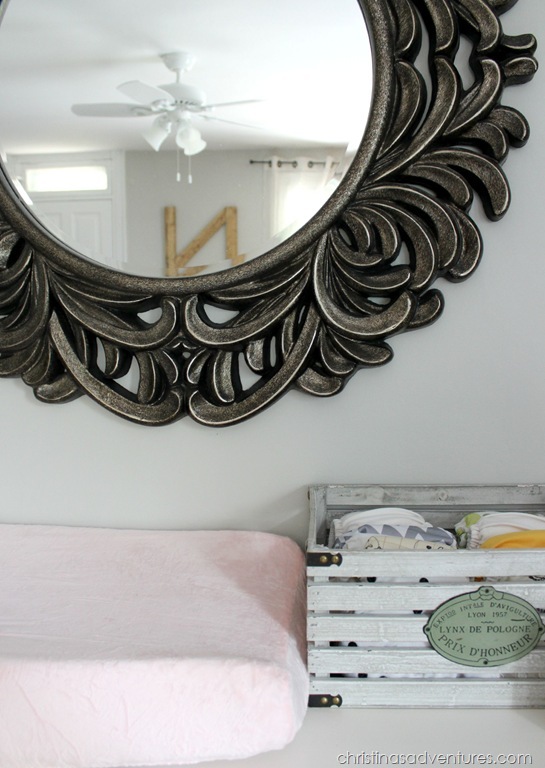 Then we added in some pale pink accents, and I couldn’t be happier with how it turned out! I stained a piece of wood, added these clearance “knobs” from the Pottery Barn outlet, and hung some vintage-y pieces. I wore that dress as a baby! 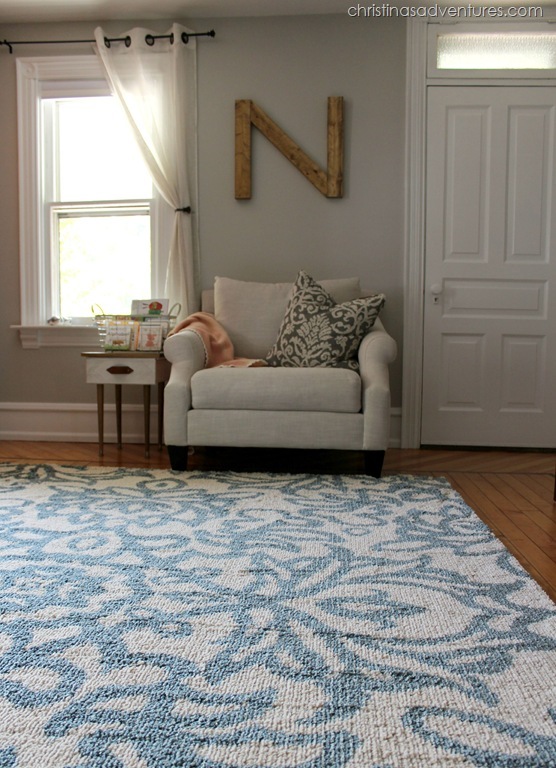 I originally tried to make this space work with a few smaller area rugs, but it just felt really “off”. I got this rug from American Rug Craftsman, and it’s truly tied the room together. It gives it such a cozy feel, and makes it feel like a space you want to stay and get comfortable in! 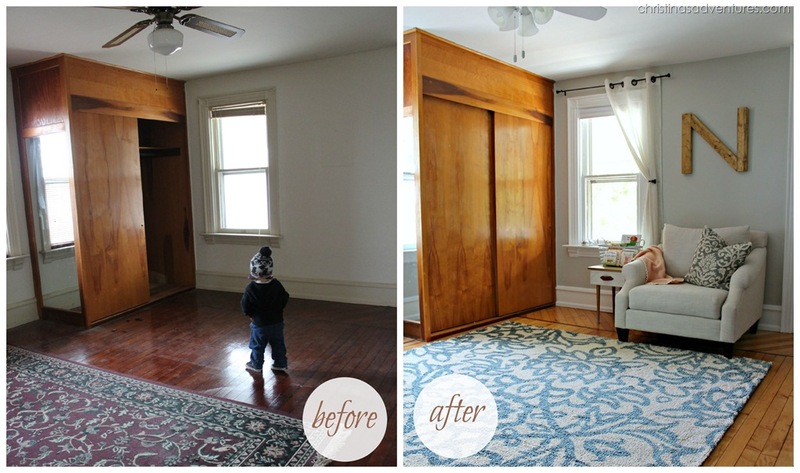 We used a changing table in our last home, but I always loved the idea of using a dresser top as a changing table. 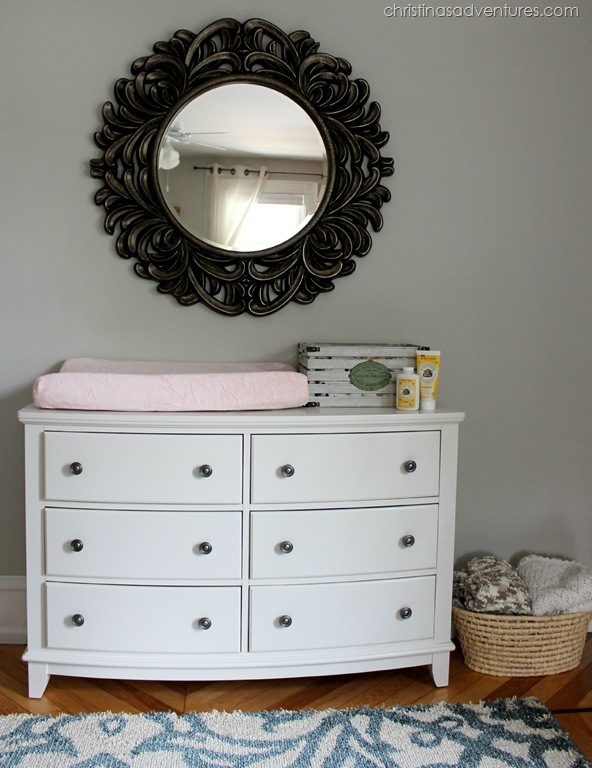 I love this dresser and the changing pad works perfectly on top of it. And HELLO I am in love with mirror! I have gotten so many compliments on it already! To be fully transparent – we have this giant wooden box of a closet that is still there, and that isn’t exactly my favorite thing in the world. BUT, it’s solid, functional, and provides really valuable storage space. I just wasn’t quite sure if I was ready to paint it, so for right now, it stays as is! We had a rocking chair in my son’s nursery, but I chose a stationary chair for this room. I never really rocked in the rocking chair, so I felt like we could get an awesome and comfortable chair in here instead. 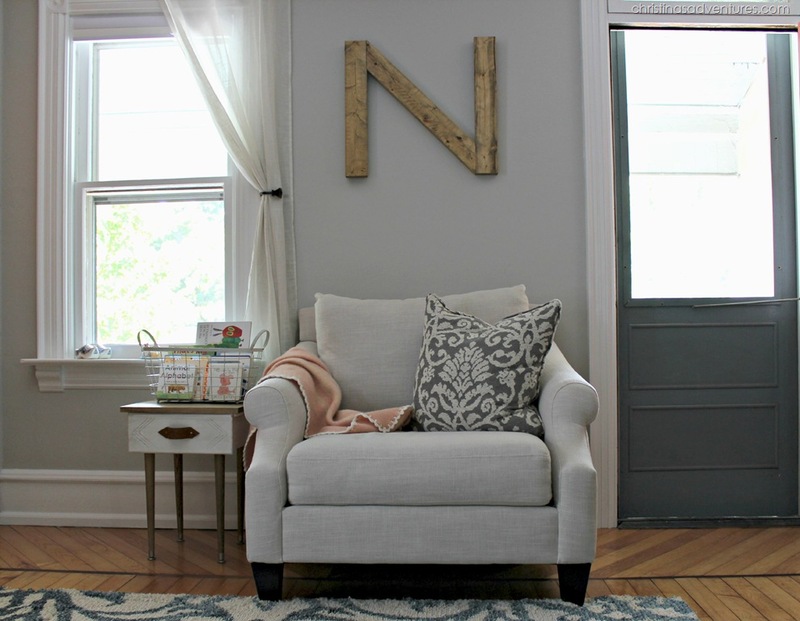 Also – that “N” that my husband made out of scrap wood from our basement? LOVE! 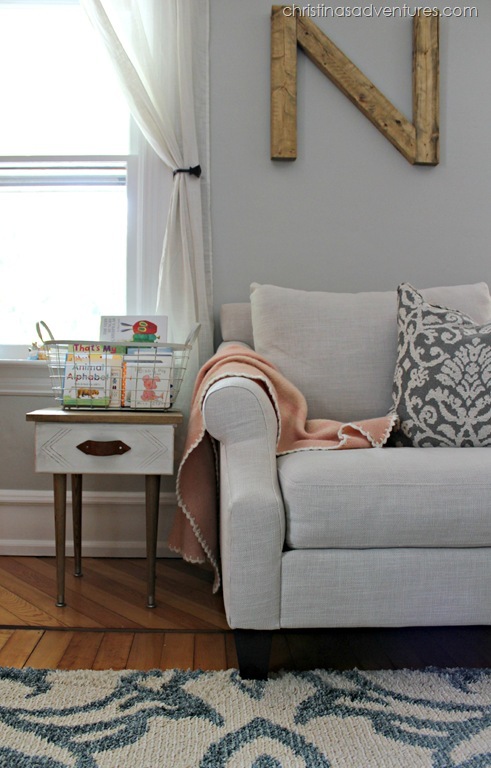 I just LOVE this space, and I’m so thankful we have a little girl to love in this space! I am so thankful to Raymour & Flanigan and American Rug Craftsmen for providing me with products for this nursery. As always, all opinions are 100% my own. This post also contains some affiliate links. Full disclosure here. 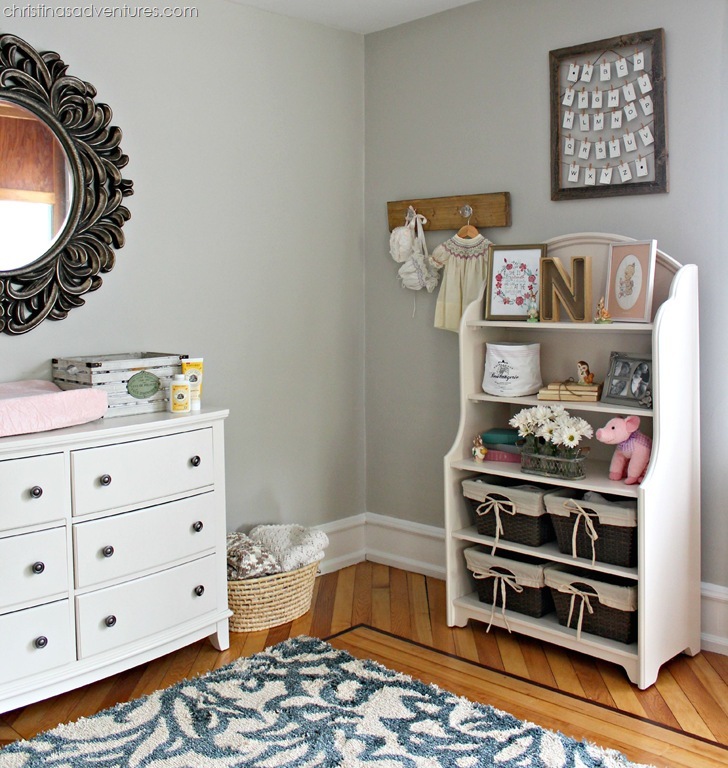 This is such a sweet nursery, Christina, for your precious baby Nora! 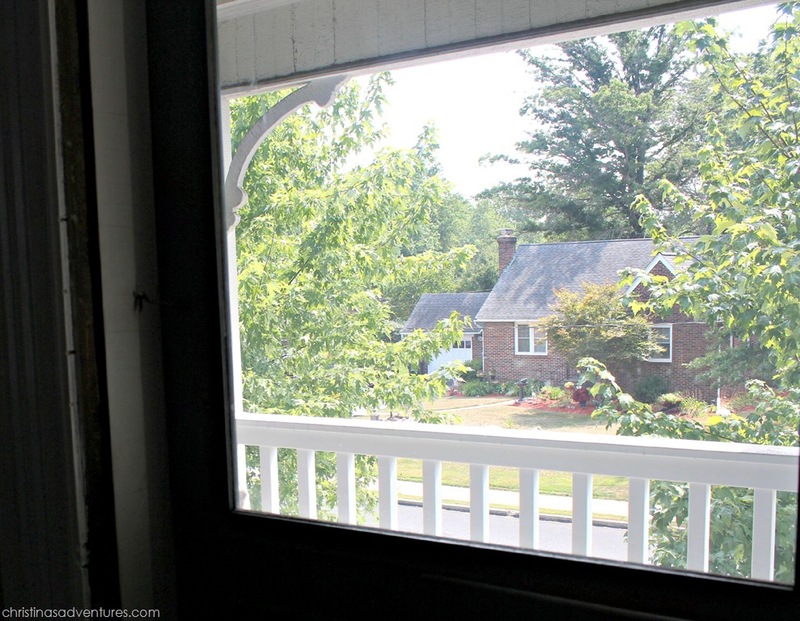 It just looks so comfy and cozy, not to mention how well it fits in with your home style. You may not be a pink & frilly person, but at some point Nora will want everything she wears to be pink &/or purple…..after seeing it with our own daughter and all 5 granddaughters, it will happen and you will love it! I just think you are doing such a beautiful job on your new-older home. That kitchen transformation was unbelievable!